Russell Investment Group was looking for ways to improve data integrity and access across its global offices. Workday’s solutions were the best fit and Collaborative Solutions was chosen to deploy it. Russell Investment Group (Russell) is a global asset management company based in Seattle, Washington with offices in 24 countries. They created the Russell Global Indexes performance benchmarks used for analyzing and updating investment performance and manage over $150 billion in assets for their customers. Russell is continually ranked among the top 100 in Fortune Magazine’s “Best Companies to Work for in America," and is always looking for ways to better serve the needs of their investors and their workforce. Russell was looking for ways to improve data integrity and access across its global offices. It was also a good time to re-examine its business processes, as current non-standardized processes were causing productivity issues among employees who were inputting duplicative data and doing everything manually. Russell wanted to remove and replace PeopleSoft with a more unified solution that would be able to grow globally with the company. Workday’s Human Capital Management (HCM) solution was the best fit for Russell’s business case, and Russell chose Collaborative Solutions to deploy it. Collaborative Solutions deployed Workday HCM, Compensation, and Absence Planning. Collaborative Solutions was also responsible for the design and development of 12 integrations. Our PeopleSoft background allowed us to work through “customization to configuration” issues that typically arise during a PeopleSoft-to-Workday migration. 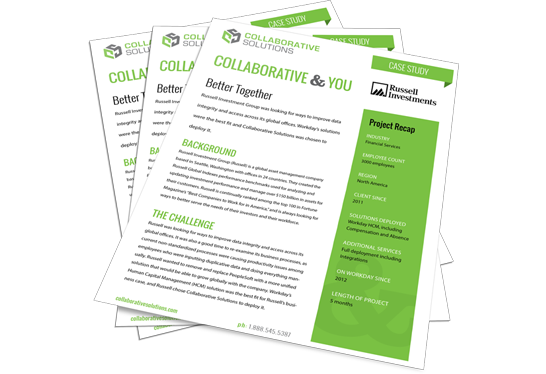 Collaborative Solutions worked with end users to design logical business processes that could handle their global needs. The project’s budget was kept on track and under control, and the deployment was completed in five months. Workday allowed Russell Investments to reduce the costs, inefficiencies, and risks associated with utilizing multiple antiquated systems. With this new business process model, dual data entry and hard-to-access analytics are a thing of the past. Russell now has standard global processes across over 20 countries, and the project came in under budget. Russell was looking for ways to improve data integrity and access across its global offices. Collaborative Solutions deployed Workday HCM, Compensation, and Absence Management, and streamlined the organization’s global business processes.